Ufone recently acquired Rozgar Microfinance Bank inorder to launch Ufone's branchless banking setup throughout the country. Back in February-2013 Ufone has been granted licence to operate national wide U Microfinance Bank by State Bank of Pakistan. Now Ufone has opened its first wallet, a mobile banking outlet, in this regard. Ufone to officially announce its Mobile Banking Service soon. Keep reading for more details. 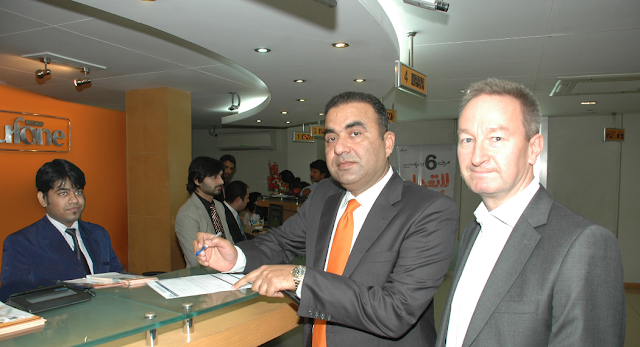 The embedded picture is from the opening ceremony of Ufone's first branchless mobile banking outlet. "Abdul Aziz President and CEO Ufone along with Rainer Rathgeber Group Chief Commercial Officer Etisalat at the first wallet opening ceremony of Ufone's 'Branchless Banking"
Note: This is not the official launch of Ufone Mobile Banking Service. This is just a news about Ufone's First Wallet opening ceremony. Ufone has been granted licence to operate national wide U Microfinance Bank by State Bank of Pakistan.